Clarifications and an investigation into the reports circulating with regard to High Commissioner Nonis’s assault and resignation is a must considering their implication for Sri Lanka’s international relations, UPFA MP and political analyst Professor Rajiva Wijesinha says. 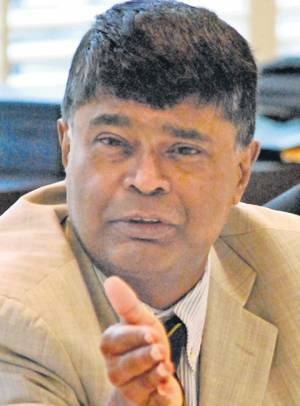 He also suggested this incident is in relation to the comments he has made concerning a concerted attempt to remove the most efficient and loyal non-career diplomats in the service and accused External Affairs Ministry Secretary Kshenuka Seneviratne of being behind many of the these attempts. “There is an attempt to remove efficient and loyal non-career diplomats we have, Dayan in Paris, Tamara in Geneva, Asitha Perera in Rome, Palitha Kohona in New York, and later I believe even Sarath Kongahage in Berlin and Chris Nonis in London. So the alleged reasons for the assault of Chris are interesting, not least because one of these envoys told me some time back thatSajin thinks he runs Kshenuka but the reality is the other way round,” he told Colombo Telegraph. He went on to state that despite these warning signs, it is unfortunate that the President continues to entrust foreign relations to Senevirathne, Vass and GL Peiris as Sri Lanka is bound to fail if the country’s foreign relations continue to remain in their hands. “But those whom the gods wish to destroy they first make mad – and drink can contribute to this, if reports are correct,” he added.